Preheat the oven to 350 degrees and line a muffin pan with paper liners. Combine flour, cocoa powder, baking soda, and baking powder in a bowl and carefully whisk them together. In another bowl, add butter and sugar and mix with a hand-mixer on medium speed until completely blended. The mixture will look crumbly. Add the vanilla and the egg. Mix well. Add half of the flour mixture and half of the buttermilk. Mix until just combined. Repeat with the second half of the flour and buttermilk. Spoon batter into the prepared muffin pan and bake for 15-17 minutes, or until a toothpick inserted into the center of the cupcakes comes out clean. 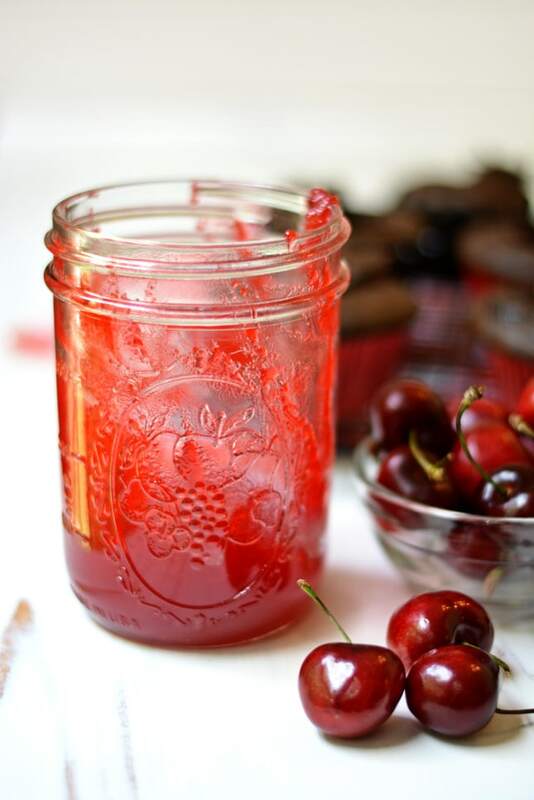 In a blender, blend the cherries and juices from the jar until completely smooth. 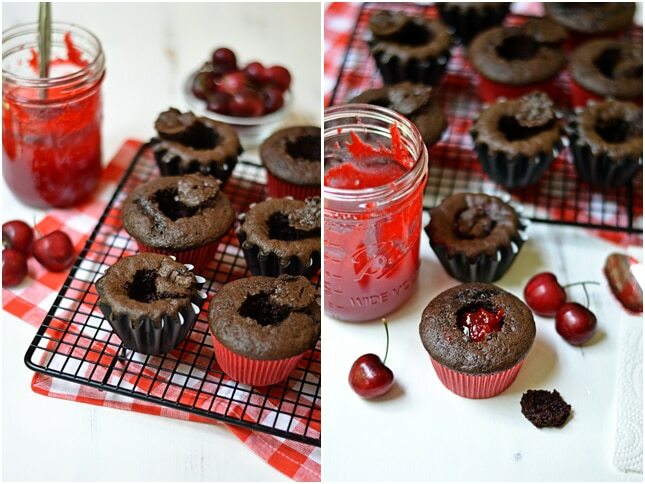 In a saucepan over medium heat, bring cherry puree and sugar to a simmer. Cook until the mixture is reduced to half, stirring often, then turn the heat down to low. Cook until the mixture is a jelly-like consistency, stirring often. Remove from heat and stir in the bourbon. Let the filling cool completely. Reserve two tablespoons of the filling for the cherry frosting. Using a knife, cut about an inch into the cupcakes and remove the centers of the cupcakes. You can keep a little piece of the cake to cover up the filling if you’d like. 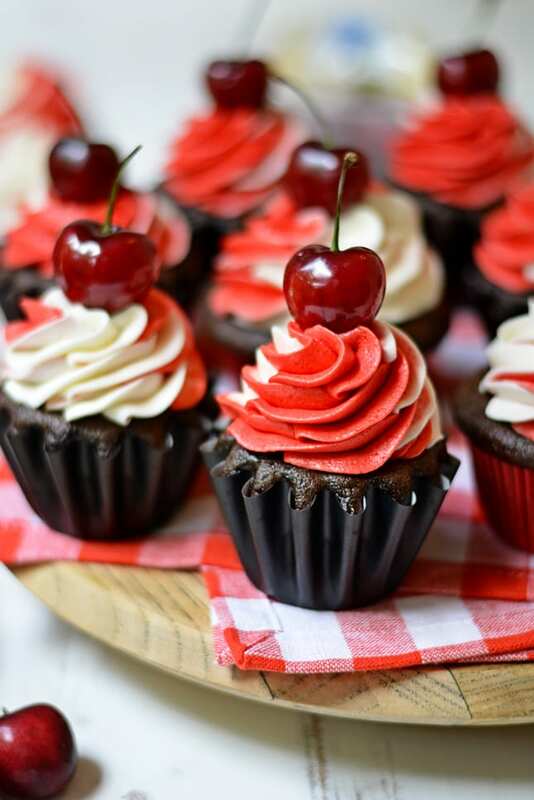 Add the cherry filling to the cupcakes and replace the tops. In the bowl of a stand mixer (or large bowl with a hand-held mixer), beat butter on medium high speed until smooth and creamy. Add the vanilla, milk, and powdered sugar. Mix on low speed until mostly combined. Then mix on medium speed until completely combined and creamy. In the bowl of a stand mixer (or large bowl with a hand-held mixer), beat butter and cherry filling on medium high speed until smooth and creamy. Add milk and powdered sugar. Mix on low speed until mostly combined. Then mix on medium speed until completely and creamy. To create the swirled frosting, fit a piping bag with a large star tip. Put the piping bag in a large cup and fold the bag down over the cup. Using a rubber spatula, add a scoop of vanilla frosting to the piping bag by scraping it off on the edge of the cup. On the other side of the cup, add a scoop of cherry frosting. Repeat this process until all the frosting is in the bag. Pipe the frosting onto the cupcakes. Garnish with a cherry on top if you’d like. I LOVE the way that swirl looks! Please make a video of how to frosting like that and share the tip # as well! Cupcake flavor is wonderful as well =). 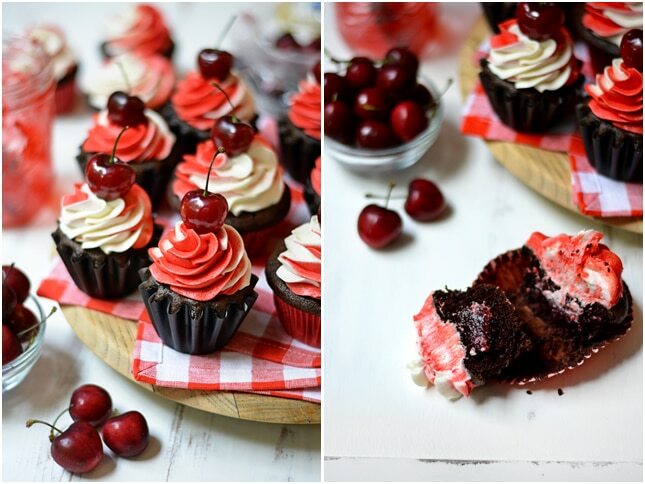 I love my black forest cupcakes with Kirsch but this would be a fun variation. These cupcakes look delish. I was wondering whether you used sweet or sour cherries? Thank you. How easy and original these are. I love cherries! And the 2 color frosting, you did a great job! It’s not very specific as to when you add the buttermilk – is it when you’re mixing in the egg and vanilla? You alternate the flour with the buttermilk for the perfect consistency! Please approximately how much should I put in grams of cherries for the filling? I’m from Brazil and did not quite understand the correct measurement.